The STIHL TS 410 is a compact and robust con saw. Long-life filter system with cyclone pre-separation makes on site maintenance unnecessary. Extremely low vibration levels (3.9m/s²). High performance engine with stratified charge system. Compact design and optimised balance for excellent cutting and guide characteristics. For use with 300mm cutting wheel. ElastoStart, primer pump and decompression valve. Bayonet filler cap for tool free opening. Can be hand held or used with the FW 20 cart. 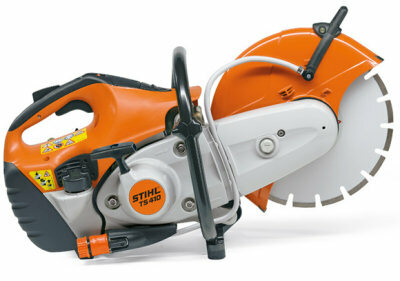 The Stihl TS410 is an advanced con saw for sale in Ireland. It can fit a 12" blade and comes with a host of Stihl's technologically advanced systems, including, Stihl's reduced emmission engine technology, Stihl anti-vibration technology and pre-seperation airfiltration system. This TS410 for sale in Ireland is also fitted with a fuel primer which, along side the decompression valve, makes the Stihl TS410 alot easier to start than it's predecessor, the very popular TS400. The Stihl TS410 for sale comes with Stihl ElastoStart which makes starting the powersaw alot easier on the muscles and joints. This Stihl con saw is the ideal tool for anyone needing a power saw.